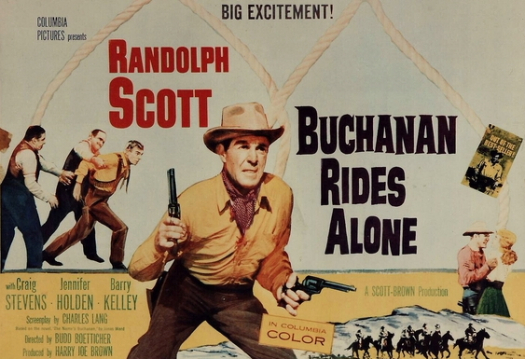 The usually stoic Randolph Scott gets to show a sense of humor in BUCHANAN RIDES ALONE, his fourth collaboration with director Budd Boetticher. The humor comes from Burt Kennedy’s script, who did an uncredited rewrite of Charles Lang’s original, foreshadowing his own, later comic Westerns. The result is a good (not great) little film that’s not up to other Scott/Boetticher teamings , but still a gun notch above average. 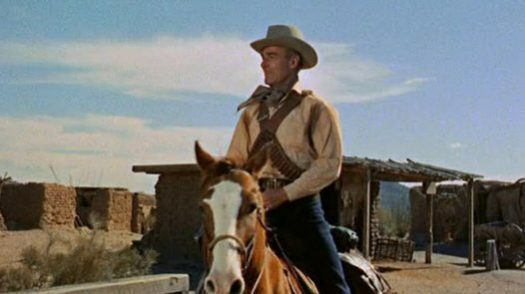 This entry was posted in Film, Film Review and tagged Buchanan Rides Alone, Budd Boetticher, Columbia Pictures, Cracked Rear Viewer, Gary Loggins, LQ Jones, Peter Whitney, Randolph Scott, Through the Shattered Lens, Tol Avery, western. Bookmark the permalink.